So you may remember last week I had a liiiiiittle bit of a fan moment about my favourite historian/ writer, Philippa Gregory. She seems to put out these huge, incredibly thoroughly researched novels at an astounding rate, and this year is no different (although I suppose the research would overlap a little). 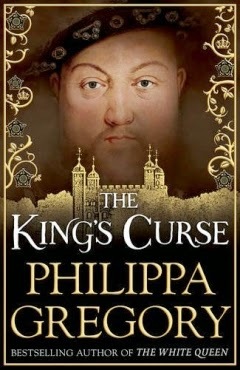 2014 sees the final instalment in the Cousins War series, The King's Curse which neatly forms a narrative bridge between this series, and Gregory's earlier novels about the court of King Henry VIII. Margaret Pole, the Countess of Salisbury, was the only daughter of George, Duke of Clarence (brother to Edward IV) and Isabel Neville and she lived her life in constant fear of being suspected of treason simply due to the fact that her maiden name was Plantagenet. As a girl, she saw her brother imprisoned in the Tower of London for being a viable heir to the York lines of succession, and she saw him executed after many years of mistreatment and sorrow. In the beginning of the novel, she is still a young woman, grateful to envelop her dangerous identity in that of a modest husband, the knight Sir Richard Pole. She serves her cousin, the Queen Elizabeth (Elizabeth of York, The White Princess), as is Lady Governess to Arthur, Prince of Wales at Ludlow Castle. She is present when the beautiful Infanta of Spain, Katherine of Aragon, is brought to England and married to Prince Arthur, and witnesses the union blossom to genuine affection. This means she is also witness to the death of Prince Arthur at just seventeen, and the sorrow and determination of Katherine to fulfil her husband's deathbed wish-- to marry his brother and become Queen of England anyway. Margaret interacts with all the major women from the series who are still alive at this point in the story. She is at odds with The Red Queen, her godmother Margaret Beaufort, who is Henry Tudor's mother and an ally of Elizabeth of York. But both of these women die early on in the plot of The King's Curse and so it is Margaret alone who will bear witness to the legacy of the Tudor era. She bears the awful knowledge of the curse created by Elizabeth of York and her mother, to punish the murderers of the Princes in the Tower by denying them male heirs and ending their line with a virgin queen, as well as the dangerous knowledge of the truth in Arthur and Katherine's relationship... was it ever consummated? Was it lawful? Margaret is questioned again and again, and her fortunes depend on her answers. After the death of her husband, Margaret is penniless and must divide her family, sending her oldest boys to be wards of a Plantagenet cousin, her middle boy Reginald to the Carthusian monks, and taking her younger two children with her to a nunnery. They survive in this manner, in shame and poverty, but most importantly surviving, until such time as the king succeeds in marrying Katherine and making her Queen. Margaret is called back to court. It seems that the York curse is true, as Margaret witnesses countless tragic lying ins, the Queen losing many sons in the years. And then, Mary is born, and Margaret Pole is appointed her governess. With her loyalties and loves divided throughout the country, it becomes increasingly difficult for Margaret to serve the king, and her friends Mary and Katherine, and still keep her head off the chopping block. This is a novel which, more than any other, depicts the paranoia and unpredictability of the Tudor Court, and seems almost to be a much more accessible account than Booker Prize winner, Wolf Hall. Margaret, while an unreliable narrator in some respects, is thoughtfully drawn as a devout and loyal woman, almost a lioness in her determination to do what is best by her family. Her best is not always the same in definition as the readers, and her one defining sin is that of her pride. Margaret is not content to stay low and safe; she must have what is due to her as a Plantagenet, despite not wanting to draw deadly attention to her name. She has largely escaped depiction in popular culture, despite being a central (cleverly hidden) figure in a number of so-called conspiracies, if you believe the theories presented in this book. In the television series The Tudors, Margaret Pole was an embittered woman, and her son Reginald a threat to the crown, constantly hunted by Henry's followers for his 'ambitions', but I have never seen her present in any other novels or films about the period. Or at least not as a major, recognisable player. The novel states, in the authorial notes, that Margaret Pole's claim to fame is that she was the oldest victim of the Tudor headman, being 67 at the time of her death. She was executed without trial, and given a very short notification that she was to die. Her execution was horribly botched, and it took several blows to behead her, whether by her flinching or by incompetence we do not know. Unlike in the other Cousins War novels, this book actually takes the narration up to the point of the narrator being killed or dying, whereas in others, the novel has ended at a point where the lady in question could see a glimmer of hope, leaving her to die in the pages of a later novel. This is an interesting way to mark the end of the novels. One might almost suggest that it is unnecessary to follow this series with the early Tudor novels, and a reader might indeed skip the novels from the points of view of Henry's wives and go to The Queen's Fool and The Virgin's Lover to see if knowing more about the Plantagenets alters the perspective given on Mary and Elizabeth at all. While I found it hard to sympathise with Margaret Pole herself, I did find this book giving me more insight into Mary, whose later tyranny has written her into the pages of history as some sort of madwoman. The book is sombre in tone, and a little less magical than the novels about Jacquetta and the Elizabeths, and I would compare it more closely with The Red Queen which also featured a severely unsympathetic narrator, the king's mother Margaret Beaufort. But its perspective was an important one, and it finished the series neatly and satisfactorily. I can only wonder now what Gregory will write next... personally I would like to see a novel from the point of view of the Lady Katherine Huntly, the wife of the 'pretend' Richard of York, who was briefly glimpsed in The White Princess.